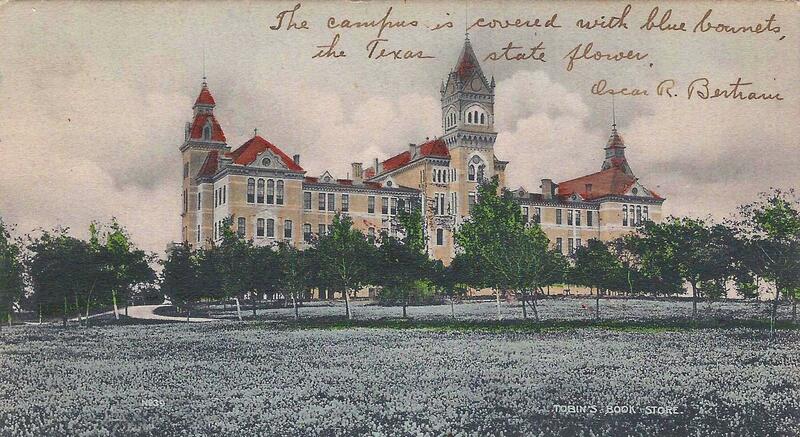 Above: A 1907 UT postcard printed with the ‘Varsity Yell and an image of Old Main. But is that it? 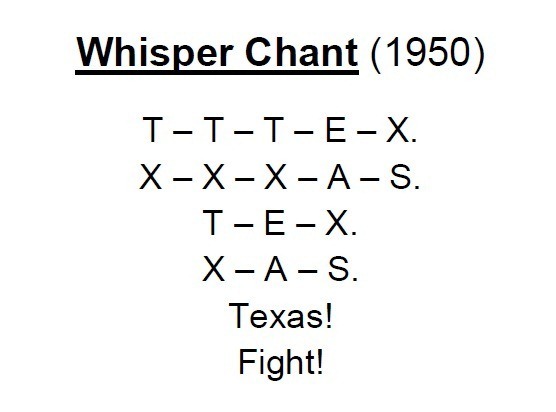 Yale has its ancient “I can nock en no – Yale!” and the University of Kansas still chants, “Rock Chalk Jayhawk, KU!” Is UT’s contribution to American college yells limited just to “Texas Fight” – ? 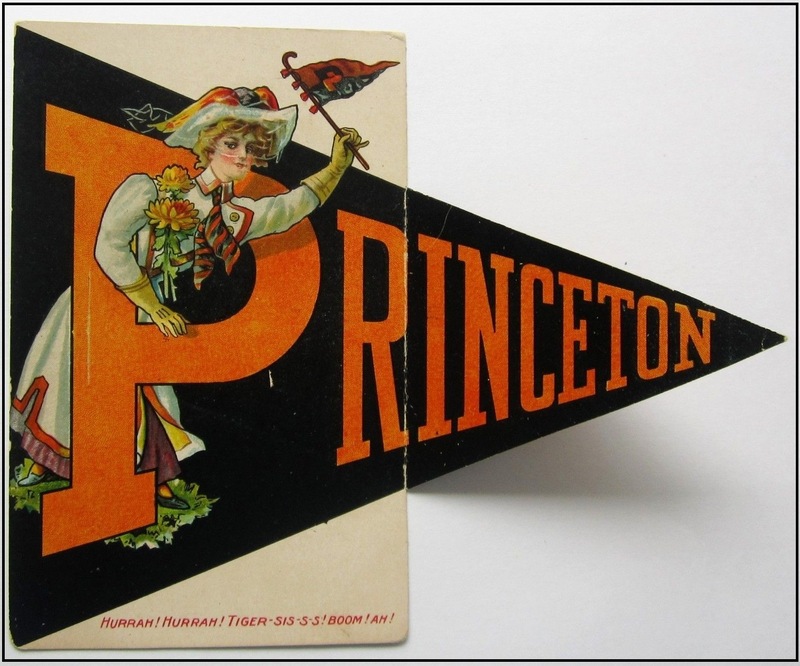 Above: A 1906 Princeton University fold-out postcard with the Tiger Yell printed at the bottom. Click on an image for a larger view. 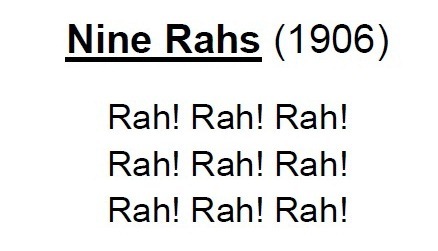 It was adapted from a similar “skyrocket cheer” used in the Civil War by the Seventh Regiment of New York City, where Sis was the hissing sound of the rocket as it was launched, Boom the explosion of fireworks, followed by the Ah of the crowd. 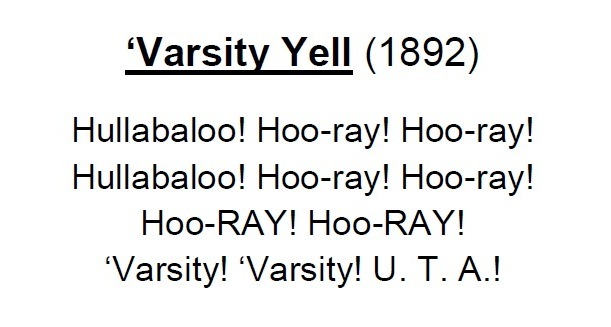 Other eastern universities created their own yells, and the tradition quickly spread to other campuses. In Austin, the development of University athletics would have a similar impact. Baseball was the favorite sport of students in UT’s infant years, and inter-class games were played on the relatively flat northwest corner of the forty acre campus. The team waiting to bat often took shade under the old trees that today are known as the Battle Oaks. 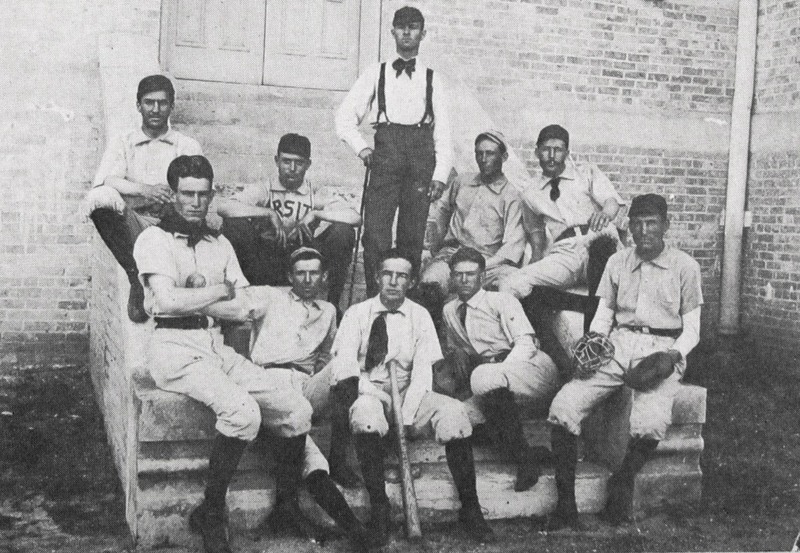 In 1885, when the University was not yet two years old, UT’s “baseball nine” played its first game on April 21st – San Jacinto Day – in Georgetown, against a team made up entirely of Southwestern University students. The favored Georgetown squad prevailed, but UT kept playing. Over the next several years, the fledgling team added local opponents to its season: what was then Saint Edward’s College, the Texas School for the Deaf, and the city’s own Austin Athletics, along with an annual match against rival Georgetown. Above: The 1892 University of Texas baseball team. In the spring of 1892, University sports became better organized with the birth of the UT Athletic Association. With its assistance, the baseball team played an extended scheduled in 1892, highlighted by a challenge from the much-heralded squad in San Marcos, whose members reportedly considered themselves to be the best in the state. As it was in 1885, the game was scheduled for San Jacinto Day on April 21st, the lone holiday UT students enjoyed all spring. “A swarm of flies could not have welcomed a patch of honey with more eagerness than did the University students San Jacinto Day,” declared The Texas University, a monthly magazine published by the student literary societies. “Our desert has few oases, and when a holiday finally arrives, the students break from their localities like young mules from a very small enclosure.” The baseball team and most of the 365 enrolled students packed picnic lunches and boarded a specially chartered train for San Marcos. 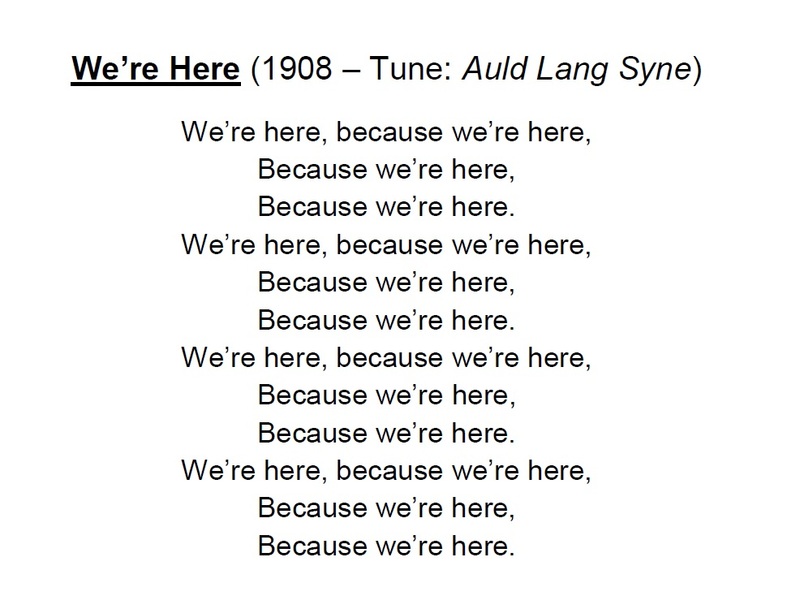 But unlike their 1885 counterparts, this group was prepared with a yell. “We must have a yell for the unsuspecting citizens of San Marcos,” recalled Ed Blount, who was then the Exchanges Editor of the magazine. Blount corresponded with the literary societies of other universities, read their publications, and for each issue of the UT magazine compiled a column on college life around the country. While reading through student publications of eastern universities, he was struck by “how fondly and frequently they referred to their college colors and yells.” A few days before the April 21st holiday, Blount recruited help from fellow students Jim Bailey and Hans Hertzberg, tore a page from his notebook, and scribbled and posted a crude sign for a mass meeting of students that afternoon. Even with such little notice, more than a hundred gathered in the History Room, a large auditorium-styled classroom on the first floor of the old Main Building. (Image at left.) The group took up discussion of a yell, though nothing initially suggested seemed appealing. But Blount, Bailey and Hertzberg had collaborated beforehand. Only Bailey had heard a yell “in its native air,” and demonstrated what he remembered to his friends. The yell was actually from the Phillips Exeter Academy, a northeast preparatory school. According to Blount, “we stole it bodily, changing the last three syllables to suit our needs.” The last three letters of the cheer, “P. E. A.” for Phillips Exeter Academy, were altered to “U. T. A.” to stand for University of Texas and Austin. ‘Varsity! ‘Varsity! U. T. A.!! 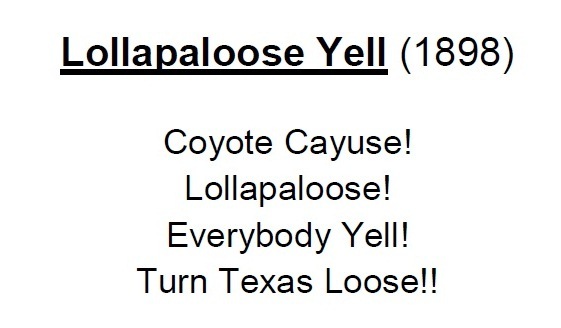 It might have seemed ordinary, and it certainly wasn’t original, but the yell won immediate approval by all present. The meeting quickly adjourned to the four story rotunda of Old Main, where the group unleashed their new cheer with so much enthusiasm that a harried James Clark, the University Proctor, was forced to shoo the students out the front door to restore order. The expedition to San Marcos was a great success. The baseball team was victorious, winning 19- 12, and the new yell was shouted until all were hoarse. The Rootatorial Committees were productive, inventing yells and songs for all sporting events. Some yells lasted only a game or two, while others had staying power for years. As UT enrollment grew, so did the number of fans at a game. 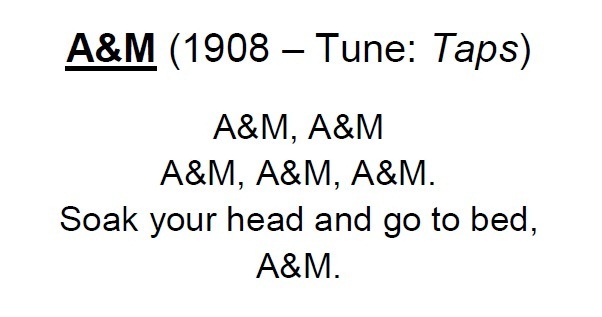 The committees produced yell books for all students – especially freshmen – and selected its first yell leader, Rent Creagor, in 1899. 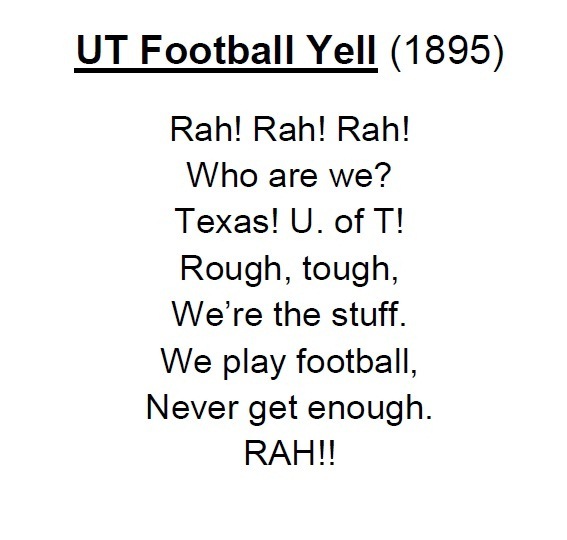 Below are just a few of the more successful UT yells created from the 1890s through 1910. Some echoed in the stands into the early 1940s, interrupted only by the intrusion of World War II. Only the Whisper Chant, introduced in 1950, is still commonly heard, but some of the others are making a comeback. 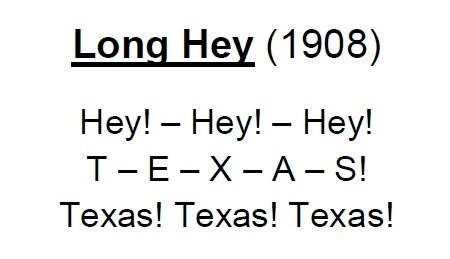 Top Yell from the 1950’s and 60’s = “Gimme a “T”, “T”; Gimme an “E”, “E”; Gimme me an “X”, “X”; Gimme an “A”, “A”; Gimme me an “S”, “S”: What does it spell, “TEXAS”; What, “TEXAS” One more time, “TEXAS”!